At Tender Bob's, one is guaranteed premium quality meats, and not surprising as Tender Bob's is operated by Meat Plus from the Subic Freeport. The meat selection is extensive, with the same quality Meat Plus has long been known for. Cucina Rusticana, and their Italian cuisine. Favorites include the Osso Buco and Saltimbocca, served with a side of Pamesan mashed potatoes. Found a small bottle at the far end of the fridge...and just in time too. Nearing its expiry date, can't let this go to waste. Made from purple yam, a local root crop, Mountain Maid's Ube Jam is perfect for a quick sugar fix. No trip to Baguio is complete without bringing home some Mountain Maid products. Produced and bottled by the nuns of the Good Shepherd Convent, Mountain Maid Ube Jam is just one of the products from the convent which include fruit preserves and jams (check out my previous post on Mountain Maid's popular Strawberry Jam at http://dude4food.blogspot.com/2012/02/whats-in-pantrymountain-maid-strawberry.html). Found a half empty tub of taho...nice. It's amazing how this humble snack of silky tofu or soybean curd is making a comeback of sorts, with more specialty shops being opened in the metro. This traditional snack can trace its roots to Chinese origins way before the Spanish colonial period, brought by Chinese traders. Traditionally served warm, chilled taho is a refreshing twist and a great way to beat the summer heat. Flavors are sharper when chilled, and the smooth texture makes this a truly unique treat. I've always had fond memories at Gerry's Grill, good times with friends and a few beers and some amazing local comfort food. Good times. Since the opening of the first branch in 1997, food entrepreneur Gerry Apolinario envisioned a place where one can enjoy the best grilled local favorites and a few drinks with friends and family. Forty-Seven branches later, that same vision continues to drive the brand, extending its local flavor overseas with two branches in the US and two branches in Singapore, and another on the way in Doha, Qatar. Quite an inspiring success story. 4:35pm, Saturday afternoon. Bacon & Spinach Quiche from Mom and Tina's Cafe Bakery. Mom and Tina's is located at FDRC Building, 106 E. Rodriguez Jr. Avenue, Ugong, Pasig City, or call 571-1541 for inquiries on other branch locations. You can also check out their website at www.momandtinas.com. Check my previous post on Mom and Tina's Bakery Cafe, go to http://dude4food.blogspot.com/2012/05/whats-in-fridgemom-and-tinas-beef-and.html. Here's something bizarre enough for Andrew Zimmern to try...Burong Hipon. I remember staying far, far away from this as a child, as with anything fermented, the smell can be too much. A traditional Capampangan condiment of fermented rice with shrimp and tomatoes, the dish can be an assault to the senses, smelling worse than any stinky cheese. I think this is a good example of a fusion dish long before that "F" word was conceived, reflecting various influences from Indian, Chinese and Malay cuisine. The blend of flavors, ingredients and spices make this a truly unique dish. A popular spicy noodle dish tracing it origins from Peranakan roots, the fusion of Chinese and Malay cultures have resulted in some pretty interesting and unique dishes. Checked the fridge and...found a box of empanadas. Cool. A mother and daughter operation, Mom and Tina's has grown into a successful business, now with two locations in the metro, offering a full menu from cakes and pastries, baked specialties, desserts, main dishes and beverages. And the success story continues, with new offerings and a continuously expanding menu. 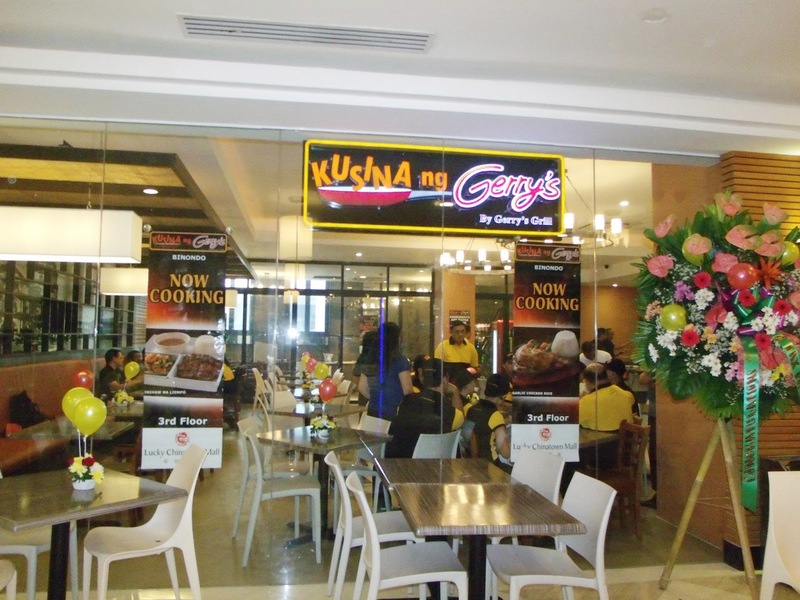 Prime Pacific Grill, owner and operator of Gerry's Grill chain of restaurants, expands its food service business with the opening of its first Kusina ng Gerry's outlet providing consumers with a new dining concept and experience. With this new brand of dining experience, consumers can now enjoy all-time favorites from Gerry's Grill at affordable prices, as much as 40% savings. Kusina ng Gerry's will offer the same product line-up as Gerry's Grill, including the popular Crispy Pata, Sisig, Kare-Kare, Lechon Kawali and many other bestsellers from Gerry's Grill. My uncle recently treated all of us to lunch at Korea Garden, and it was a great time to bond with family, rediscover old favorites, and discover new ones. Korea Garden is one of those early pioneers in bringing real authentic Korean food to the metro. And after all these years, Korea Garden has not lost its touch. Traditional appetizers, providing a combination of sweet and spicy, perfect way to start the meal, a prelude to even more good things to come. Mussels Lombardi (P 450), imported mussels sauteed in white wine, garlic, olive oil and herbs.The mussels were fat and juicy, nicely seasoned and full of flavor. Squeeze some lemon and enjoy. And don't let that garlicky broth go to waste, dip some bread and experience a burst of briny and garlicky flavor that's just way too awesome. I was recently invited to the launch of McCormick's new Facebook App called McCormick Flavor HQ which extends to a mobile website. It's a cool Facebook App that features a wide range of recipes using McCormick's herbs and spices, from appetizer to mains, desserts, and even beverages, all in one easy to use App. Very cool. The event also highlighted a buffet with various dishes using McCormick's herbs and spices, providing guests to experience first hand how McCormick "brings passion to flavor" in all the dishes. Nice. Just received a little package from my cuz (thanks Teresa! ), and from the looks of it, I knew it was something different...and it was. The Nama Chocolate Champaign Pierre Mignon, rich, velvety smooth melt-in-your mouth texture like no other. Made from the finest premium ingredients, selected chocolates, fresh cream and world class quality liqueurs, the combination releases delicate, subtle, yet rich flavors unique to Royce' Chocolate. I don't usually get excited with fusion, and I remember trying some that tasted somewhat strange, or maybe too new and unfamiliar. But I was intrigued when I saw a photo at Geisha Modern Japanese Cuisine's menu board, and curious as to how the elements will be fused. What else could you do with crispy pork belly, right? A lot more I guess...the Skewered Pork 72 (P 370++), crispy pork belly on rolled rice with black & white sesame seeds and a side of crisp fried spinach and nori. A tart, citrus based Ponzu dipping sauce completes the dish. Using the tradtional Filipino Lechon Kawali or deep-fried pork belly as the base, the dish then combines elements of Japanese cuisine resulting in something new and refreshing, a pretty cool twist on crispy pork belly. Feeling beat by the summer heat? Bummed out by constant traffic? Stressed? Sounds all too familiar. You need a serious pick me up. I recently tried the new Jamba Juice Acai Supercharger Smoothie (P 150 for a 16 oz cup), something healthy for a change. ...time for some ice cream. Time for Double Dutch Overload.